Objective Alternative ovarian stimulation protocols for in vitro fertilisation (IVF) have grown in popularity. Yet, patient populations best suited for these protocols have not been defined. Our objective was, therefore, to determine national IVF utilisation patterns and live birth rates of various ovarian stimulation protocols. Setting Academic-affiliated private fertility centre. Participants Aggregate data published by Society for Assisted Reproductive Technology for autologous IVF cycles performed in the USA during 2014 and 2015 were analysed. IVF cycles were stratified based on ovarian stimulation protocol: 205 705 conventional stimulations, 4397 minimal stimulations, 2785 natural cycles and 514 in vitro maturation (IVM) cycles. Repeat cycles could not be determined in this analysis. Outcome measures Utilisation patterns and age-specific live birth rates for various ovarian stimulation protocols. 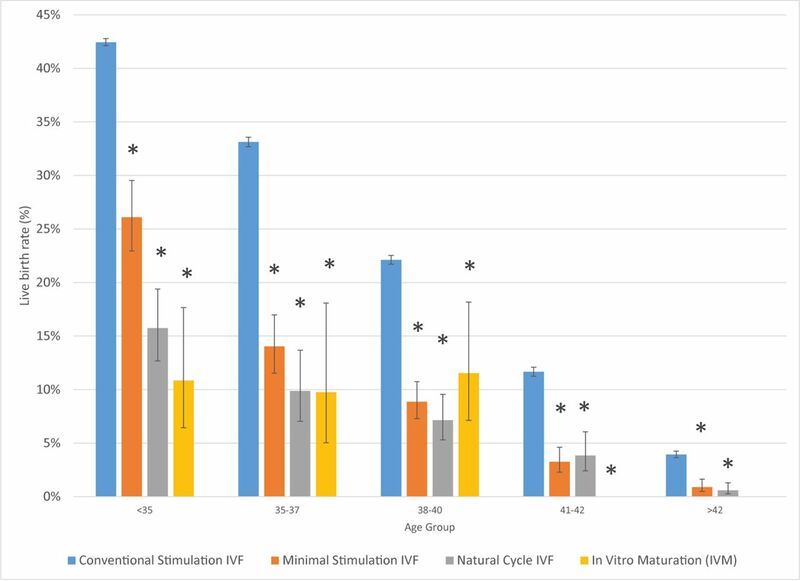 Results With advancing female age, utilisation of conventional stimulation protocols decreased, while minimal stimulation and natural cycle IVF increased. Diminished ovarian reserve diagnoses were in all age groups less prevalent in patients undergoing conventional stimulation than with all other protocols. Live birth rates were highest with conventional stimulation at 42.4%, 33.1%, 22.1%, 11.7% and 3.9% for <35, 35–37, 38–40, 41–42 and >42 female age groups, respectively. The difference in live birth rates between conventional stimulation and other protocols widened with advancing age from 1.6-fold to 3.9-fold among women <35 years of age, reaching 4.4-fold to 6.6-fold among women >42 years of age. Conclusions In comparison to conventional stimulation IVF—minimal stimulation, natural cycle IVF and IVM protocols offer lower but still acceptable live birth rates among young women. These alternative protocols are frequently used in older women and those with diminished ovarian reserve, despite their lower live birth rates. The reasons for this apparent incongruity warrant further careful exploration. Retrospective cohort study of aggregate US national data on autologous in vitro fertilisation cycles performed during 2014 and 2015. Data were analysed to determine utilisation patterns and age-specific live birth rates for various ovarian stimulation protocols. Limitations stem from a lack of standardised definitions and confounding patient characteristics which could not be fully adjusted for. Since utilisation patterns and live birth rates for various ovarian stimulation protocols have never been compared on a large scale, we here analyse published US national IVF live birth rates based on type of ovarian stimulation. The purpose of this study was not to confirm or reject claims made in the literature in support of any one of these stimulation protocols. For that purpose, readers are referred to recent publications.17–19 To facilitate patient counselling, we here instead, simply, wish to report how in the US utilisation patterns and live birth rates differ at varying ages with various ovarian stimulation protocols with reference point cycle start. As this study will demonstrate, national US outcome data for IVF largely are contradictory to current utilisation patterns of alternative ovarian stimulation protocols. As reported in the 2014–2015 publicly available data set of the Society for Assisted Reproductive Technology (SART),20 we compared female age-stratified IVF live birth for various ovarian stimulation protocols, including conventional and minimal stimulations, natural cycles and IVM cycles. IVF cycles were stratified based on ovarian stimulation protocols: 205 705 conventional stimulations, 4397 minimal stimulations, 2785 natural cycle and 514 IVM cycles. Since ovarian reserve is a major predictor of response to ovarian stimulation and ultimately chance of live birth with IVF, we also performed above analyses specifically for patients with diminished ovarian reserve (DOR) diagnosis for each age group and treatment protocol. Outcome comparisons between stimulation protocols were made using the two-tailed Fisher’s exact test, and the Wilson CI for binomial proportions. Conventional stimulation IVF served as the reference for all statistical comparisons. P values of <0.05 were considered statistically significant. All statistical analyses were performed by the centre’s principal statistician (SKD), using SAS V.9.4 statistical software. Patients were not involved in the design of the study. Table 1 summarises the characteristics of IVF cycles for each ovarian stimulation protocol, it is stratified by female age group. Mean numbers of transferred embryos with advancing female age increased more rapidly among women undergoing conventional stimulation IVF than among those undergoing all other stimulation protocols. 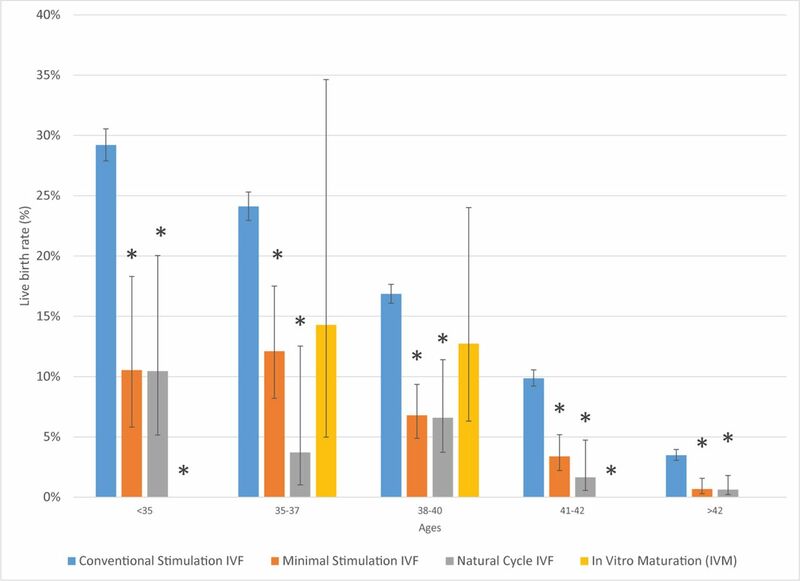 With advancing age, the number and proportion of conventional stimulation cycles, however, decreased, while minimal stimulation and natural IVF cycles increased. As expected, the proportion of patients with DOR in all groups increased with advancing age but was somewhat lower among women undergoing conventional stimulation IVF than among those undergoing all other stimulation protocols. Interestingly, 57.9% of all minimal stimulation and natural IVF cycles were performed by only two US IVF centres, suggesting that these two protocols have received only limited acceptance. Table 2 summarises the pregnancy outcomes for each ovarian stimulation protocol used during the IVF cycle, the data are stratified by female age group. In addition, figure 1 demonstrates in more detail the primary live birth rates for the various ovarian stimulation protocols, stratified by female age. As the figure demonstrates, starting with youngest patients under age 35 years up to oldest patients above age 42, conventional ovarian stimulations uniformly resulted in the highest live birth rates, followed by minimal stimulations, natural cycles and IVM. While this order was most pronounced in youngest women under age 35, differences between minimal stimulation, natural cycles and IVM disappeared above age 35 years, though dominance of conventional stimulations over all other stimulation protocols increased with advancing age. Primary live birth rate per oocyte retrieval cycle for the whole study population stratified by ovarian stimulation protocol. Based on combined final 2014 and preliminary 2015 US national data reported by Society for Assisted Reproductive Technology. Conventional stimulation IVF served as the reference for all statistical comparisons. *P<0.05. IVF, in vitro fertilisation. The difference in live birth rates between conventional stimulation and other protocols, thus, widened with advancing female age from 1.6-fold to 3.9-fold among women under 35 years to 4.4-fold to 6.6-fold among women above age 42. Excluding data from the above mentioned two centres which performed 57.9% of all minimal stimulation and natural IVF cycles showed slightly higher live birth rates (between 0.7% and 6.1%) for these protocols in the remaining centres for all age groups, however, the live birth rates remained significantly lower than those achieved with conventional stimulation. To assess the impact of DOR as a confounder, we separately assessed only patients with DOR (figure 2). As expected, DOR patients across all age groups demonstrated lower live birth rates than the entire study population (figure 1). However, even DOR patients, separately, again demonstrated the widening difference in live birth rates between conventional stimulation and other protocols with advancing female age from 2.8-fold among women under 35 years old to 5.2-fold among women above age 42. Primary live birth rates per oocyte retrieval cycle for patients with diminished ovarian reserve diagnosis stratified by ovarian stimulation protocol. Based on combined final 2014 and preliminary 2015 US national data reported by Society for Assisted Reproductive Technology. Conventional stimulation IVF served as the reference for all statistical comparisons. *P<0.05. IVF, in vitro fertilisation. As expected, here presented data confirm universally declining live birth rates with advancing female age. However, somewhat unexpected, the data also reveal contradictory findings to current practice patterns. For example, as table 1 demonstrates, alternative stimulations to conventional stimulations are increasingly used with advancing female age; yet, as figure 1 demonstrates, especially minimal stimulation and natural cycle IVF, while still producing lower live birth rates than conventional stimulation, are clearly more effective in younger women under age 35 than at older ages. Especially minimal ovarian stimulation with a 26.1% live birth rate and natural cycle IVF with a 15.7% live birth rate in young women may be considered potential alternatives to conventional stimulation, even though conventional IVF at 42.4% clearly produced higher live birth rates. Here observed live birth rates for minimal stimulation and natural cycles in women under age 35 are, indeed, surprisingly robust. Though the DOR diagnosis was somewhat more common among patients undergoing alternative than conventional stimulations, this difference in DOR prevalence, at most, only partially explains the large difference in live birth rates (figure 1) since restricting the analysis to only patients with DOR did not substantially alter the findings (figure 2). We were not able to analyse other infertility diagnosis such as polycystic ovary syndrome (PCOS) in the present study. It will be important to follow up this analysis for other infertility diagnoses, it is especially interesting to study efficacy of IVM protocols in patients with PCOS. Such an approach may help to identify patients who are best candidates for various protocols. We previously noted that, after female age, number of oocytes retrieved and embryos available for transfer are the most important predictors of live births in IVF cycles.5 23–25 Since implantation rates decline and aneuploidy rates increase with advancing female age, the importance of oocyte and embryo numbers increases because more embryos can be safely transferred into the uterus to compensate for lower implantation rates. Younger women with high implantation rates, in contrast, will often, even with only few embryos, still conceive. Here presented findings, therefore, make clinical sense but are not reflected in how these alternative stimulations are currently clinically used in the USA. Cumulative live birth rates (per embryo cohort in a single cycle) would, likely, favour conventional stimulation even more profoundly, since these protocols are more likely to result in surplus transferable embryos than any of the alternative protocols. This analysis is limited by lack of a standardised definition of minimal stimulation IVF; SART permits individual fertility centres to designate the most fitting stimulation type for each cycle. Additionally, because this analysis is based on aggregate data, we were except for age and diagnosis of DOR, not able to assess confounding patient characteristics, including number of prior IVF attempts and repeat cycles. We, therefore, cannot rule out undiscovered patient selection biases for individual stimulation protocols. It is possible that some patients undergoing stimulation with alternative protocols had prior conventional stimulation with very low oocyte and embryo yields. Moreover, a retrospective study design does not permit to control for various factors which led to the selection of a stimulation protocol by a physician for each patient. We also note that there is an imbalance in the size of the study groups in our analysis with more than 90% of cycles in all age groups receiving conventional stimulation. However, it is important to note that by analysing aggregate national data for the entire population of patients rather than a sample of the population the risk of selection bias is somewhat mitigated. Despite above noted limitations, it is unlikely that adjustments for such biases would substantially change the principal findings given the large sample size and that live birth rates were 1.6-fold to 6.6-fold higher with conventional stimulation than all other protocols. We also note that most minimal stimulation and natural IVF cycles were performed by only two fertility centres, where selection of these protocols is likely more a reflection of practice patterns than biased patient selection of poor prognosis patients. Indeed, while these two centres reported marginally lower live birth rates than other centres, excluding their data from the analysis did not substantially alter the principal findings. Because live birth rates are significantly lower with minimal stimulation IVF than conventional IVF in this analysis of national data, cautious use of minimal stimulation protocols in carefully selected patients rather than their universal application is warranted. Alternative stimulation protocols including minimal stimulation, natural cycle IVF and IVM appear relatively ineffective in women older than 40 and younger women with DOR. Despite these observations, such protocols maybe still be useful in patients with severe DOR who previously did not respond to conventional stimulation. The authors wish to thank all SART members for providing clinical information to the SART database for use by patients and researchers. Without the efforts of SART members, this research would not have been possible.
. Resurgence of minimal stimulation in vitro fertilization with a protocol consisting of gonadotropin releasing hormone-agonist trigger and vitrified-thawed embryo transfer. Int J Fertil Steril 2016;10:148–53. Society for Assisted Reproductive Technology. National Data Summary. https://www.sartcorsonline.com/rptCSR_PublicMultYear.aspx?reportingYear=2015 (Accessed 10 May 2017).
. The effect of conventional vs. mild ovarian hyperstimulation on the total number of live babies born from a given oocyte retrieval. Clin Exp Obstet Gynecol 2015;42:571–2. Contributors VAK, DHB and NG developed the concept of the study. All authors contributed to data accumulation. SKD and VAK contributed to data analysis. All authors contributed to data interpretation. VAK wrote the manuscript. All authors contributed to revisions of the manuscript and approved of the final submission. VAK took responsibility for the accuracy of the data analysis. Funding This study was funded by intramural funds from the Center for Human Reproduction and by grants from The Foundation for Reproductive Medicine. Competing interests VAK previously served as a consultant to the CDC. The Center for Human Reproduction (CHR) annually routinely reports IVF outcome data to CDC and SART. NG, DHB and VAK are listed as co-owners of several already awarded and still pending US patents, none related to the topic of this manuscript. NG is a shareholder in Fertility Nutraceuticals, LLC and owner of the CHR. NG and DHB receive patent royalties from Fertility Nutraceuticals, LLC. NG and DHB have received research support, travel funding and lecture fees from various Pharma and medical device companies, none, in any way related to this manuscript. Ethics approval Because this study investigated only publicly available anonymised data, it received expedited IRB approval. Data sharing statement Source data are available from the Society for Assisted Reproductive Technology: https://www.sartcorsonline.com/rptCSR_PublicMultYear.aspx?reportingYear=2015 or by contacting the corresponding author.